This is the moment arsonists were caught on camera starting a fire at a supermarket in Sheffield. 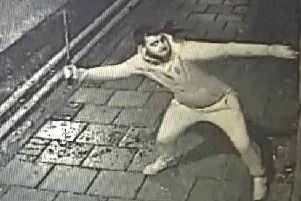 The attack at the Tesco store on Ecclesall Road, which happened on Sunday evening at around 8.50pm, was captured on CCTV. Footage, shared on the MRSkyRoom YouTube channel, shows four people, one of whom appears to be dragging a burning item, approaching the rear of the shop, on Snuff Mill Lane. They then gather around the object and appear to kick it, sending sparks flying. One of them then appears to kick or throw the object towards the rear of the store, setting alight pallets and packaging stacked there, before all four run off. The culprits’ faces cannot be seen but they appear to be boys or young men. Firefighters spent around 90 minutes tackling the blaze.